Are you running out of hard space on your computer? One of the problems is that the trash can might be overflowing. Putting something in the trash on your computer doesn’t remove it from your hard drive. It is taking up space until your empty the trash. 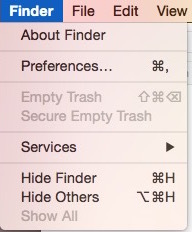 To empty the trash go to the Finder menu on the top left of your desktop. Click “Empty Trash.” A few seconds later whatever was in the trash is now deleted from your computer. You may notice “Secure Empty Trash” in that same menu. Choosing this option makes it more difficult to have a file recovered by various apps in the event you need it back. This takes longer to delete the files if you choose this option. If you want to see if emptying the trash helps restore space on your computer open a folder on your desktop before you empty the trash. At the bottom you will see how much free space is left on the drive. After emptying the trash that number will change. If you have a lot in the trash that number might make a significant change. I suggest emptying your trash on a regular basis. But you don’t need to do it right away every day. Sometimes you want to grab an item back from the trash. After the trash has been emptied, you can’t easily recover trashed stuff. Have a question your want covered? Leave a comment below.